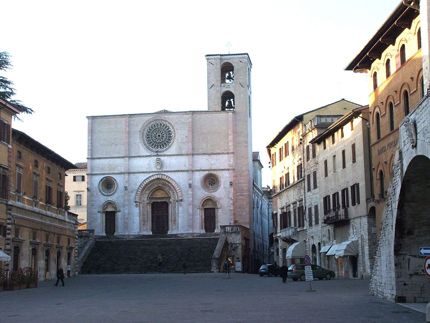 Todi was founded by the umbri, and it became a town in the middle ages. 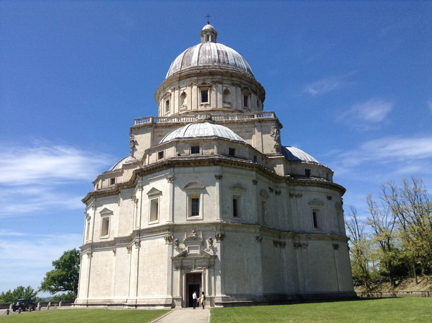 Todi was the birthplace of a poet and a mystic called Jacopone – known as Jacopone da Todi. The main square called Piazza del Popolo was built a series of roman cisterns on the site of the roman forum. 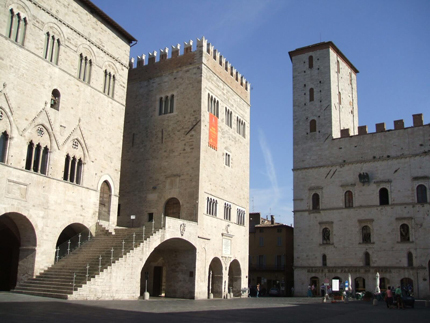 Opposite the cathedral there’s Palazzo dei Priori dating from 1293-1337. The coat of arms of the town is a bronze eagle. The Dome has a lovely interior with a raised presbytery and a semi-dome in the apse. There are frescoes by Spagna by Giovanni—and by Ferraù Fenzoni. At the end of the north aisle steps lead down to the lapidary museum and crypt. In the Piazza del Popolo a flight of steps take you to an entrance to the town hall square which occupies the gothic Palazzo del Popolo. This one of the oldest town halls in Italy. The adjoining Palazzo del Capitano del Popolo has two elegant three-light windows. Inside these palaces there’s the town museum and the Pinacoteca. In a raised position there’s the church of San Fortunato. The façade is unfinished and the portal has a carving with saints and curious figures. The interior is an example of german gothic churches. In the crypt are presented the remains of Jacopone da Todi. 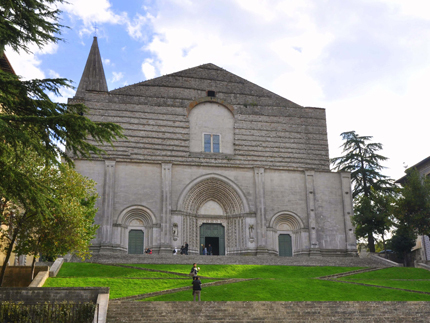 Outside the walls of the town there’s the church of Santa Maria della Consolazione, a masterpiece of the Renaissance. The architect Cola da Caprarola begun the church in 1508 and finished it in 1607.